You can successfully orienteer with just a map, but there are some really useful pieces of equipment that may improve your orienteering experience. Most orienteers train and compete with a thumb compass. Right-handed orienteers use a thumb compass on their left thumb. Left-handed orienteers use a right-thumb compass. A popular model is the Silva NOR. More expensive models are used by elite competitors because they settle faster and are more stable when running. These are shinpads for orienteers. They protect your legs and clothing from the forest undergrowth. An alternative is thick orienteering socks which serve a similar purpose. You can hire SI cards at all orienteering events, but if you'd like your own dibber they can be bought direct from SPORTident. 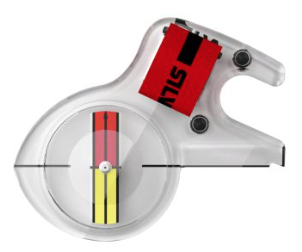 The cheaper SI Card 8 is perfect for all levels of competition. More expensive models, like the SiAC or AIR dibber (pictured) are faster, offering contactless ‘punching’, a flash and a beep at each control. A whistle is required for most major races as a way of getting help in an emergency. It's good practice to always carry one. The signal is six short blasts to summon help. Whistles cost 50p and can be bought from the club coaches. 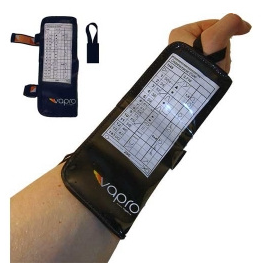 A control description holder is worn on the forearm and holds your control description sheet. This sheet contains information about the controls that will be visited on your course. They are printed on the map, but most orienteers prefer to use the CD holder to avoid constant refolding of the map mid-race. Many orienteers wear a GPS watch to record their run and use for data analysis after the race. A popular model is the Garmin Forerunner. Upload your run to Routegadget to see which way you actually went at that path junction and how you fared against other competitors on your course! Most orienteering equipment can be bought online at specialist shops - Ultrasport and CompassPoint or visit their stands at larger events to try things on and see which compass you like best.